products I carry are listed on the left side of my blog under "Items I Sell Category". 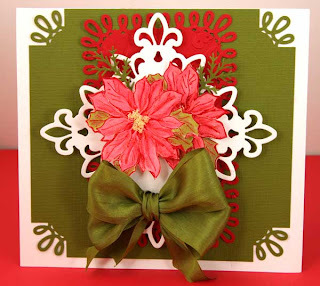 This Poinsettia Card was designed for Saturday's Card Get-Together. the Copic Markers and the Fluer De Lis Pendant Punch from Spellbinders. So, I combine several things on the card. They really enjoyed it. You can read the directions below. I started with a 6x6 Neenah White card and cut a piece of green cardstock at 5.5 and used the new Martha Stewart Loop punch on the corners. Then I cut a 3.25x5 piece of of red card stock and punch the corners with the Loop punch and then punch all around the paper with the Loop Edger punch. I used the Fluer De Lis Pendant from Spellbinders to cut out the white pendant. One thing that I have found using these intricant designs is you MUST use a lighter weight paper (about 65# weight) and also use a piece of wax paper between the die and the paper. Your pendant will come out of the die much easier and not tear. I stamped two Poinsettias with Versa Mark Ink and then sprinkled red embossing powder and embossed the flowers. I cut it out and then colored it using my Copic markers. Yellow Flower Soft was added to the center of one of the flowers for interest. Then I cut into the petals and curled them a little. I glued the first flower down and then the 2nd flower was placed over and to the side of the bottom flower and popped up with some dimensionals. Just Gorgoeus, Joan! Glad you had a successful event!!! A beautiful card Joan, love your poinsettias! A wonderful way to combine the dies and punches! Ah, this is just stunning! 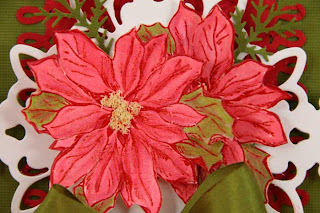 I love the poinsettias and all of the cutting designs! TFS the tips on cutting with these dies too! Joan is is a gorgeous card. The poinsettias are so pretty on the Fleur De Lis die cut combined with the MS punch. Sounds like everyone had so much fun at your workshop. Hi Joan ~ This card is stunning!! Love the corner punch and the beautiful bow!!! I sure wish I could have been at your shop...So glad you all had such a good time!!! Pretty!! I love it Joan. Joan, this is a beautiful card! I love all the detail on the poinsettias. BEAUTIFUL CARD! I love everything about this card. The corner punch is also a cool addition. Your workshop looked like a lot of fun. Just wished I lived closer.